In Part One, you learned about the final plan to be delivered to the city by the Preston Center Task Force. It’s been two years in the making and cost $300,000 to produce a plan with little substance and holes a developer could drive a truck through. 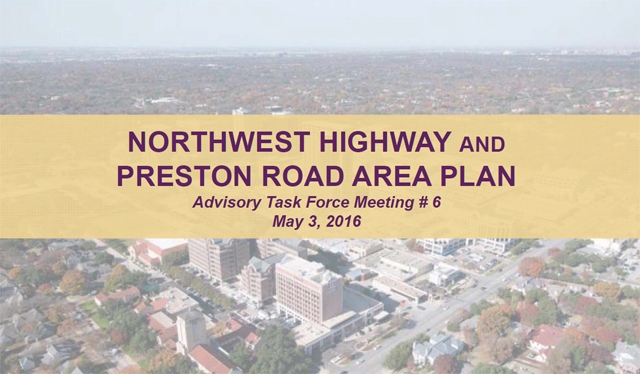 Here in part two, we’ll finish out by reporting on the recommendations for development in the area. There’s lots of talk about walkability, and an equal amount talk about luxury housing product. This means that just like today, people who live in the area don’t generally work in the area. An infinitesimal number of Preston Center workers walk to work today, and luxe-only development assures that will not change. Apparently walkability isn’t for area cashiers, cooks, waiters or firemen/women. The vibrancy claimed to be the goal will not happen without housing that’s affordable to those who also work in the area. Without it, what we’ll get is a plastic Disneyland that comes to life with the flick of a switch. We’ll also have the added traffic as those workers commute in for their shifts. Lose-lose. 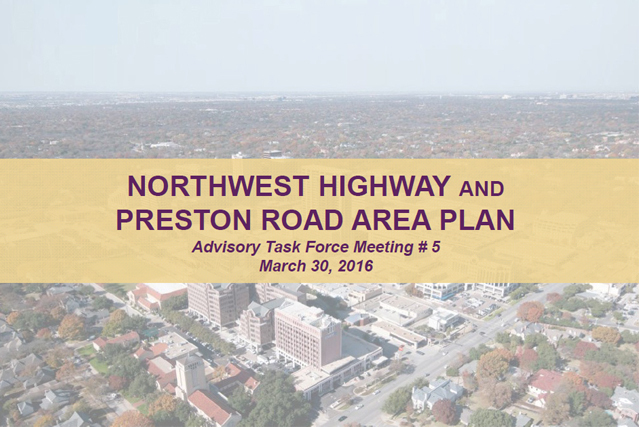 If I could sum up this final report by the Northwest Highway and Preston Road Area Plan task force, it would be that it took two years and $300,000 to identify what will cost the city even more money and more time to actually attempt to solve. But that’s what you get when a group rife with personal agendas discards most of the hard data. 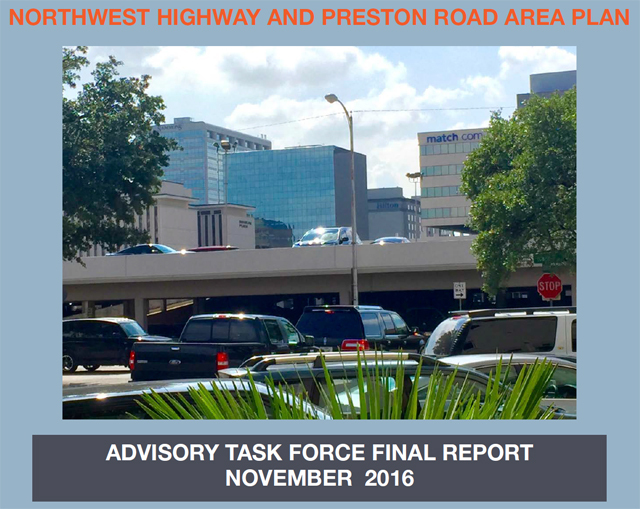 As Laura Miller said, “Every task force member agreed on every word” in the self-authored report. This was after the task force commandeered the report back in July from the hired consultants. Consensus equates to a watered-down, namby-pamby report with all the right buzzwords to calm the natives while delivering absolutely nothing of substance. The report tells the audience what they already know and want without a shred of information or detail on how they’re going to address any of it … except with more study and more money. 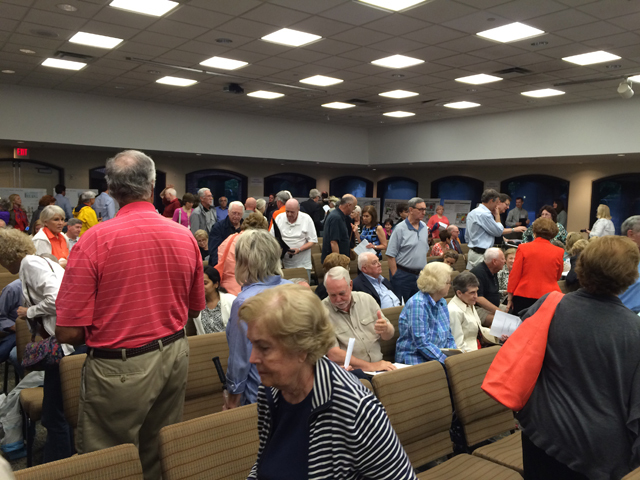 The audience at last night’s meeting nodded on queue to the placation … traffic is a problem … sometimes it’s hard finding lunch time parking at Preston Center … the Preston Center parking garage is ugly … Mark Cuban needs to put those mansions back. But what was not comprehended was that every, single, solitary issue and crack-pot recommendation contained in this report is someone else’s problem to study, evaluate, fix and pay for. It’s like they typed up the flip charts of suggestions from the community meetings. The actual recommendations are without detail or teeth, often fobbed off on another entity. 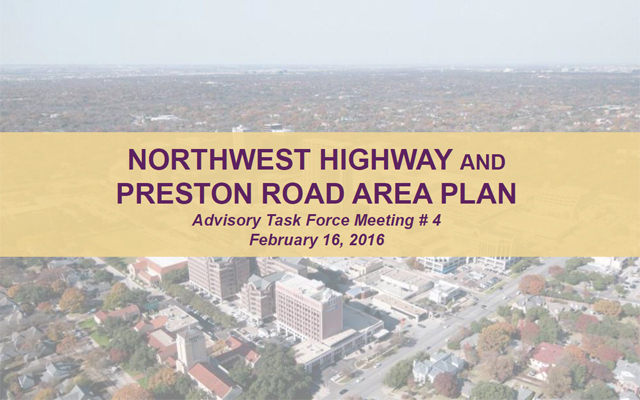 My top-line takeaways from last night’s public flogging unveiling of the latest from the Preston Center Task Force were that its results were better than previous airings, but still not fully baked, and as expected, the Pink Wall Negative Nancys were out in force only at the end of the process. But as I told Dallas City Council member Jennifer Gates, I didn’t feel like I immediately needed a stiff drink afterward … and that was progress. I find the Kimley-Horn methodology and output flawed, relying on what can be done versus what should be done. The disconnect between development’s specific impact on underlying infrastructure (roads, parking, etc.) and how they must be connected. The missing baseline research on how optimized infrastructure impacts development scenarios. The results appear to be a shoehorning of development into a defined area with little intelligence and common sense applied to how it would function best. It’s about promoting “could” rather than “should” … and being a study that recommends, it should be all about the “should. Data tables detailing the specific infrastructure impacts of every increase of “X” number of residential units, or “X” increase in office square footage, or “X” increase in retail square footage on traffic patterns. 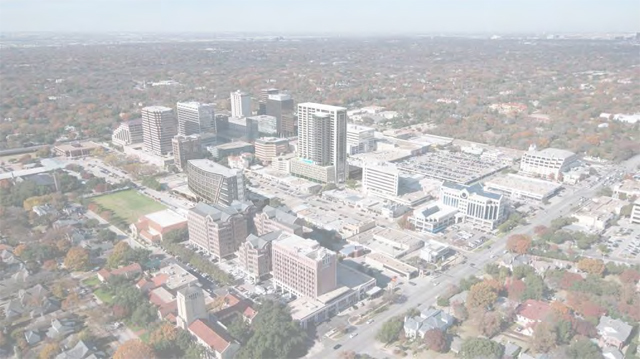 Armed with that information, buckets containing the suggested mix of increased residential, office and retail and a system to subtract from those buckets as new development is considered. If a bucket runs dry, that type of development is at capacity. A system of triggers where “X” amount/type of development requires “X” in infrastructure improvements from the city. Given the increase to tax base, it’s quid pro quo from the city investing in increasing their revenues. Overlaying all this should be intelligence in placing realistic development in realistic locations. I’ve seen none of this, however I detailed it a year ago. For nearly three hours we sat through the latest, painful presentation by Kimley-Horn, who is being paid $350,000 for their efforts. It’s getting better, but either these guys don’t present to lay people often or they’re fresh off the MBA boat. Thankfully I’d pre-downloaded the deck before the meeting and was able to question them on how they’d presented their data. Let’s just say that as someone who’s pretty data-driven, I might have gone a different way. Loads of questions and clarifications by Task Force members proved my point.